This is without doubt one of the best books I’ve read this year. I was spellbound, the storytelling is superb, the characters are unforgettable, and the setting comes across so vividly that I had no difficulty in imagining the locations. Add to that the narration written in Thomas McNulty’s own uneducated voice, fluent and richly descriptive and so easy to read, despite the mix of Irish and American slang. The fact of their love underlies the whole book. But the next stage of their lives was so different, fighting in the Indian wars against the Native Americans as the settlers moved west and then in the Civil War. I’m not keen on reading about wars, battles or fights of any kind but I found the descriptions in this novel were exceptional, truly heart-rending, although I would have preferred fewer scenes of war and massacre. Barry doesn’t spare the details and clearly depicts the horror and waste of war, commenting in Thomas’s voice: Killing hurts the heart and soils the soil (page 225). In a way I thought it was odd how this book held my attention. I was surprised by a number of things – the very long paragraphs, sometimes extending to several pages – the strange grammatical errors and figures of speech, and at times passages written in the present tense. 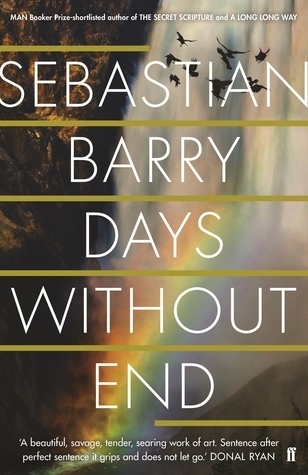 And yet, Barry’s prose is so lyrical and poetic that I think this is what made the book so compelling to read. Each time I picked it up to read I became lost in its pages. It is not perfect, but then I often find that that doesn’t matter when I’m so totally captivated by the writing, which is why I’ve given this book 5 stars. I’m so glad you enjoyed this. I have done it with both my book groups and have yet to find anyone who didn’t think it was outstanding. Like you, Margaret, I don’t usually go for books about war. But this one sounds exceptionally well-written. And I like it that the focus is on the characters and their experiences over the years, rather than on the war experience itself. I bought this book for my elderly father, suspecting he would enjoy it and he loved it. But I never imagined that it would be my sort of book. From your review, Margaret, I find myself wondering if perhaps it may be.